A truly stunning effect, Negative Gravity may have your spectators believing you truly have control over the laws of gravity. The magician borrows a ring from the audience and then produces an elastic band. 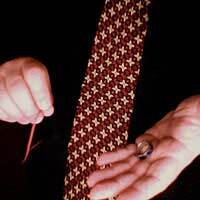 After snapping the elastic band to create one long “string”, the magician threads the ring on to the band. Holding first one hand higher and then the other, the magician shows how the ring falls from side to side, obeying the laws of gravity. After one such demonstration the magician pauses, and then concentrates as the ring begins to fall UP the elastic band. Using an elastic band makes this trick work as it provides the needed friction and movement. An elastic band and a ring of some sort are all that is needed. No advance preparation is needed if you can count on borrowing both a ring and an elastic band - otherwise provide your own and allow them to be examined before and after the trick. A fantastic impromptu trick, Negative Gravity can be done on the fly or as part of an established routine. If the magician borrows both the elastic band and the ring, the audience will have to accept his magical powers. After borrowing a ring from the audience, the magician threads the ring on to the band. This is the crucial part of the trick - the magician can grasp the end of the band in the right hand, but with the left hand he must grab it close to the middle, with the extra band hidden in his hand. A quick tug and pull and the band is stretched out, but not in an obvious way. The magician raises his left hand and lets the ring fall down, stopping when it hits the right hand. He then explains the powers of the law of gravity, something that is a natural force that can’t be messed around with - except, of course, by a magician. The magician then raises his right hand and lowers his left, again allowing the ring to fall. If he wishes he can repeat this to the right and then back to the left, but the trick can only happen when the left hand is down and the right hand is up. When ready to perform the trick, the right is down on the left hand. Now the magician concentrates, and slowly, imperceptibly, releases just a bit of his grip with the left hand. The natural properties of the elastic band will cause it to contract towards the right hand - the upper hand. The friction of the elastic will stick to the ring, cause it to travel upwards with the elastic. The motion of the band will be invisible from a very short distance away, but the sight of the ring moving upwards against gravity - apparently at the power of the magician’s mind - is very notable. Ham it up and make sure to practice how to grip the band properly and release it with the right speed.